6’+ Episode 145 is Up! This is an interesting situation for me. Since I’m going to be covering the film later on, I decided to save most of the back story about The Dead Matter for said review. Here are the basics: Our story begins in 1996, when Edward Douglas made a short student film called The Dead Matter. Years later, the overwhelming success of Midnight Syndicate gave him the opportunity to revist the project without being limited by running time or budget. Both the feature film and soundtrack were released in 2010. Got it? Good, let’s start the review! Tolling bells and percussion take us into “‘The Dead Matter’ Main Title,” where haunting piano work and wordless female vocals create an ethereal feel. Listening to this conjures up death and ghosts in my mind. But don’t let the fake ending fool you. “Dangerous Meeting” offers pounding and unnerving music with Psycho-like violin stings to create a sense of danger and unease. The opening drums are used to great effect, as are the various voices and roars. The wolf howling at the end is a great touch. “Entering the Dusk” creates unease with its spooky buildup of strings, wind, piano snippets and ghostly vocals. It also offers a sense of something creeping, so it could also work with a spider scene. “Unexpected Company” will make you feel like you are being chased thanks to its suspenseful and speedy violins. The spooky opening and snippets of soft piano work in “Hollows Point” are mournful with a dash of danger. I love the uneasy fluting and the tried-and-true effect used to imply ghosts. You’ll know it when you hear it. 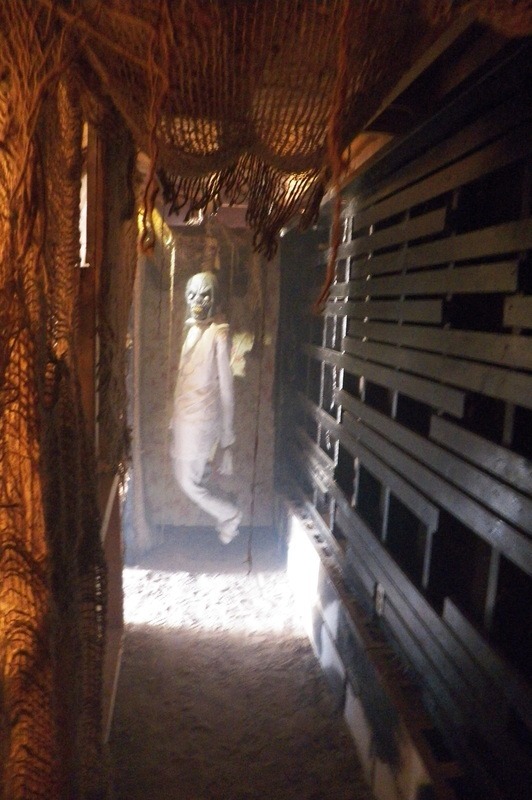 Its sense of an evil presence lurking lets you use this in a variety of haunt scenes. I suggest filling a room with these. Not only is it a creepy visual, but the music will make people look around the room and notice the optical illusion. That, combined with the music, will give your visitors chills. “Ian McCallister” is the album’s shortest track since it clocks in at just under a minute. But the extra soft piano and haunting vocals (with plenty of other spooky touches) make it seem longer. It also blends seamlessly with the next track, “Seance.” Although the piano picks up the pace compared to last track, it still has all of the eerie stuff you love. If anything, it increases them as well. The surprise pounding beat and violins appear for a sense of extreme danger and the ending buildup gets blood pumping. As the name implies, it’s great for any haunt’s séance or a room where a Pepper’s Ghost fades into view. Perhaps you could try doing both at the same time! “Sebed Suite” is more subdued than previous track, but still creepy. Its soft music goes well with the wordless unisex vocals and it builds in intensity towards the end. There’s also a sample from the movie, but it works well in with the overall ghostly feel. This track could be used to enhance a jump scare by having your performer leap at at just the right time. Especially from a place which seems unlikely to be a hiding place in the dark. “Gretchen and Mark Pym” has a classic Midnight Syndicate feel that is further enhanced by the vocals, bells and dreamy chimes. The soft and slow piano work is also very effective. “Late Night Snack” starts off soft and eerie, but soon picks up the pace and gets scarier thanks to its frantic violins. The occasional footsteps and flapping bats really add to the effect and I can see this being used in a dark area filled with fake bats. The moody “Possession” offers a slow creepy buildup and magnificent use of strings. The pounding percussion speeds things up in chase-like tone which blends into the next track. “Death is the Answer” enhances its fast-paced menacing tone with chanting in Latin and a woman screaming “stop”. The piano and frenzied violins are a great touch and I can easily see this working in a cult room. “Trilec Labs” is the album’s longest track, clocking in at a little over 7 minutes. The opening is moody and ghostly thanks to the wordless vocals and later gains a lurking feel when the strings pick things up. But things really pick up at end. In addition to the sense of pursuit created by the use of percussion, the ghostly unisex voices and wails make things especially eerie. “You’re So Funny Frank” combines ghostly voices, soft musical tones and evil laughter to create a track perfect for any creepy hallway or spooky scene. Just as the name implies, “Sleep” is soft and peaceful…but also creepy due to its spectral voices. It’s perfect for a haunted bedroom, especially one with a misdirection-based scare which occurs when people are leaving the room. Soft (but pounding) drums, strings and a malicious feeling combine in “Finale.” At first it creates a mood of panicked fleeing, but the ringing bells make me think of a crypt scene while the occasional use of a ghostly old fashioned piano makes me think of a haunted saloon. Tolling bells and piano work also appear in “‘The Dead Matter’ End Credit Suite,” but this track has more of a classic Midnight Syndicate feel. To the point where anyone familiar with their work could easily identify them as having made this even if they had never heard this particular album. Gavin Goszka’s pounding and powerful “Lost” kicks off the first of many rock tracks. Just as I said when I first encountered the track on The Dead Matter: Cemetery Gates, the use of synth work and guitar makes for interesting combo, along with a light piano riff and various spooky touches. Just like the other rockin’ tracks on this album, it can be listened to all year. “The Graveyard” is the first of two tracks by Lazy Lane. You might remember vocalist Lily Lane’s work with Midnight Syndicate on their album, The 13th Hour. Or if you’re a Lazy Lane fan, you might remember this track from Keepers of the Gloom. But old fan and new listener alike will enjoy what they hear. In “Shadows (Haunt Rocker Remix),” a storm and Jerry Vayne’s guitar skills give new life to a Midnight Syndicate classic. 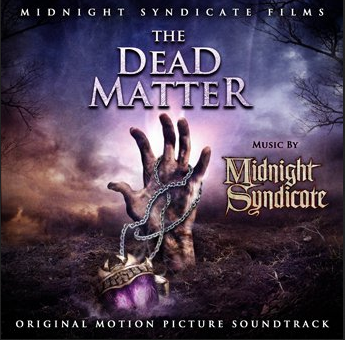 Eternal Legacy’s “The Dead Matter” really grew on me thanks to its low, slow buildup to medium paced guitars and vocals (along with some samples from the film). Those interested in haring more from the band should check out their album Lifeless Alive, which includes this track as well. Lazy Lane return with a selection from The Chills called “The Girl Upstairs.”	I love the haunting vocal work coupled with some beautiful piano and instrumentation. “Noctem Aeternus (Masquerade Remix)” re-teams Midnight Syndicate with Destini Beard for a new take on an old favorite. While it retains the spooky piano and opening of the original, the rest is all new vocal work from Ms. Beard. This one of the few tracks on the album that I think could still work in a haunt despite not being orchestral. UV’s “Graveyard (Dead and Buried Remix)” has spooky touches from the original at times, but this is mostly new material. The industrial opening leads to a catchy beat and lots of drums, with plenty of samples from film thrown in for good measure. It’s easily the most danceable selection on the soundtrack. Hipnostic’s “Ritual” would work even without the vocals, but who wants that? Certainly not me. The rockin’ guitars and drums further help make this an excellent listening experience. We return to spooky orchestral music with the final track, “Sean is in the Ground.” It’s a haunting nursery rhyme of sorts with eerie children chanting the title over and over again. If your haunted attraction has a scene based around a playroom, then this is the track for you! Once again Midnight Syndicate has created a fantastic listening experience. The bulk of the tracks are suitable for looping and there’s plenty of material to mix and match from when you play it on Halloween. Although the rock tracks might not suit your haunting purposes, they’re still great and can be enjoyed throughout the year. I know I have been playing “The Girl Upstairs,” “Lost” and “Graveyard (Dead and Buried Remix)” numerous times already. But if they are the sort of thing your haunt is looking for, you’ll be happy to know they are included in Midnight Syndicate’s registration program for haunted attractions. What are you still reading his for? Go out and grab a copy! UPDATE: It turns out some of the details regarding the origins of The Dead Matter given in this review are wrong. You can find the correct information and further details about the project in my review of the film.